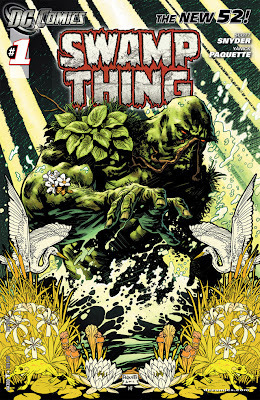 Swamp Thing generates tension right from its deceptively painterly cover page. Paquette’s mirrored frame of frogs, birds, and vegetation immediately gives the impression of order and even framed artwork. The presence of an actual frame highlights a kind of organic formalism which suggests a “natural order.” Out of this organic symmetry emerges the Swamp Thing, nature’s avatar, who is anything but symmetrical and ordered. Bursting out of the swamp, the Swamp Thing cuts a path conflicting with the diagonal rays of light in the background. Blooming flowers and untamed foliage run rampant over his physique, a diametric opposite of the carefully composed “natural” frame surrounding him. As Alec Holland will observe later, “Everyone thinks of vegetative life as calm and gentle. Peaceful. But the truth is the opposite.” The Swamp Thing is nature unchecked and running wild, the true nature. Judging from the next few months of cover solicitations, it seems like this use of an organic “frame” around a cover image of conflict will continue at least for this initial run, subtly underlining what seems to be one of the main conflicts of this arc: the clash within nature between order and chaos and the threat that this clash can bleed into both Alec Holland’s life and even the very nature of the comic book form. The threat that is first hinted at here is actually two-fold. Not only does this unknown force have broad implications for the entire DCU (as evidenced by its effect on Superman, Batman, Aquaman and countless others), it also works as a formalist threat to the nature of comics. This as yet unnamed force is so threatening that it even affects the literal edges of the comic book universe – the borders. Comics are defined by what exists inside (and out) of their panels, so if the nature of the panels’ borders becomes threatened, the threat just becomes that much more serious. While Snyder doesn’t seem to be going for a literal meta-fictional angle à la Grant Morrison’s run on Animal Man, the fact that the physical design of the book itself is affected just serves to further underline and enhance this force’s devastating potential. After Alec’s interior monologue plays out over these two pages of chaos, we find him far away, in Louisiana, working at a construction site. The knowing tone of Alec’s narration, suggesting an inside knowledge of both truth and horror, underlines the parallel plotline being set up by the art without commenting on it directly. By thematically connecting Alec’s narration to the mass animal deaths, Snyder is already suggesting that Alec will hold the key to this unfolding mystery – even his private thoughts connect to the rest of the world and the DCU. It’s also easy to forget that the narration is doubly efficient because it also sows the seeds of his internal struggle over his relationship to nature. Just like the flowers of his memory, the boards he is working on are screaming through the whir of the table saw, reminding him that he has a special connection to nature that he shares with no one else. While the chronology of Swamp Thing remains largely intact from that of pre-reboot continuity, Alec Holland, as he exists here, is almost a completely new character. The original Alec Holland previously appeared only in flashback, seen in the memories of the Swamp Thing from Moore’s run. While Alec remembers being the Swamp Thing (he even has feelings for Abby Arcane, whom he has never met), he is not the same Swamp Thing of the past, but the original Alec Holland brought back to life. Faced with the ultimate identity crisis, Alec believes he can’t be a man if he has a monster’s memories. Just as Alec is trying to separate himself from the past he remembers, but didn’t experience, Swamp Thing underlines his inner conflict visually through the use of panel borders that seem to be made of branches and greenery, which only appear when Alec is directly grappling with his connection to nature.3 These nature inspired panels both mirror and oppose the “tears” which occur when the malevolent force is present. The greenery suggests life and growth – perhaps even dangerous, uncontrolled growth,4 while the tears suggest rupture and decay. Yet they also perform the same function: they represent violent attempts by powerful forces to enter and contaminate or absorb natural orders. For Alec, the Green is attempting to draw him back into its fold and deny him the chance to become a normal man. For the DCU, the unknown force (which I’ll call the Other) is attempting to infect and spread its influence to the whole world. Snyder then allows us the only “free” page in the whole issue, when Alec attempts to throw the Bio-Restorative formula (which he didn’t actually destroy) into the swamp. The final page shows us the Swamp Thing preventing Alec from throwing the formula into the swamp. The key here is that this is the only page in the whole issue that is truly free from any kind of borders. Even previous spreads that basically work as splash pages have the Other’s “tears” dividing them into sections. 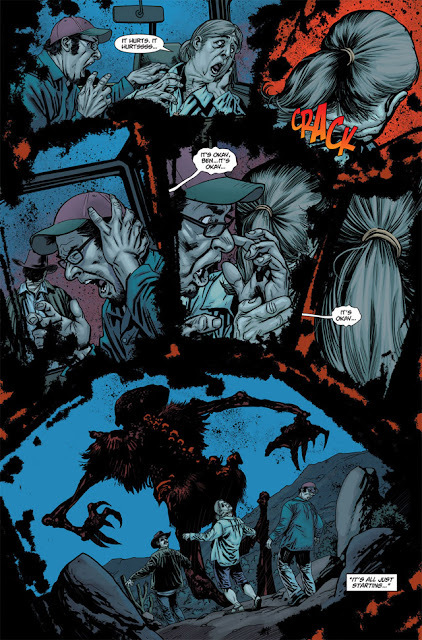 After an entire issue of increasingly suffocating and threatening borders, Snyder finally gives Alec and the reader a chance to breathe, but only through a confrontation with the Swamp Thing, in the flesh. By placing the first appearance of the Swamp Thing at the point of both relief and climax, Snyder reveals the path that the rest of the story will take. 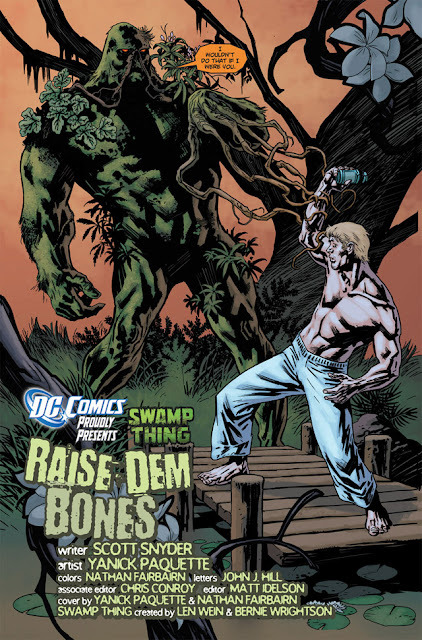 Powerful forces plague both Alec Holland and the world at large, and they seem inextricably linked with the mystery of Alec’s connection with the Swamp Thing. But, before he can join in the fight against the Other, Alec must first reconcile with an “Other” of his own, a task which may prove even more difficult. 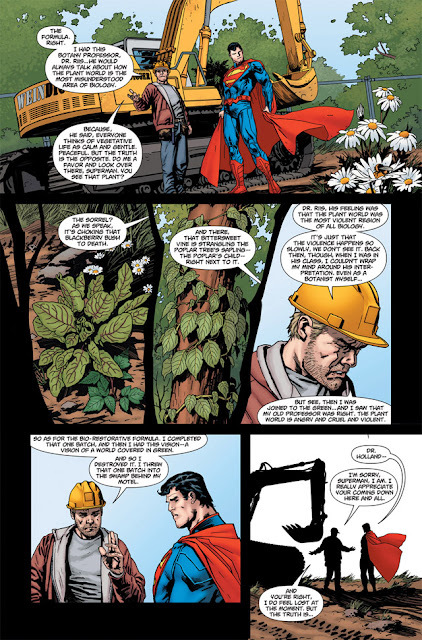 Through a careful, thematic interweaving of story, art, and form, Snyder and Paquette create a comic that tills the soil and plants the seeds of a much larger story, while it simultaneously probes Alec’s interior state for connections and resonances that will be important in the coming issues. Here’s hoping it stays this good. All Images Copywright DC Comics. 1 – I’m always somewhat ambivalent about assigning credit for things like panel design and layout to either writers or artists. In filmic terms, I would tend to consider the comics version of mise en scène to be the job of the writer, while the actual look and skill of the art itself to be the cinematography, and therefore the job of the artist. Obviously, good teams probably collaborate on all aspects to a certain extent, so, for future reference, if I attribute an aspect of framing or placement to a particular person, it could probably also be attributed to another member of the artistic team. 2 – Contrapuntal narration derives from a musical term referring to, “The technique of combining two or more melodic lines in such a way that they establish a harmonic relationship while retaining their linear individuality,” or, “A contrasting but parallel element, item, or theme.” Matt Zoller Seitz has written insightful pieces on this type of narration multiple times (1, 2). Snyder used it extensively in Detective Comics and continues it with both Swamp Thing and Batman in the re-launch. Here it serves to underline Alec’s connection with other things going on in the DC Universe and provide thematic resonances between difference plot threads. 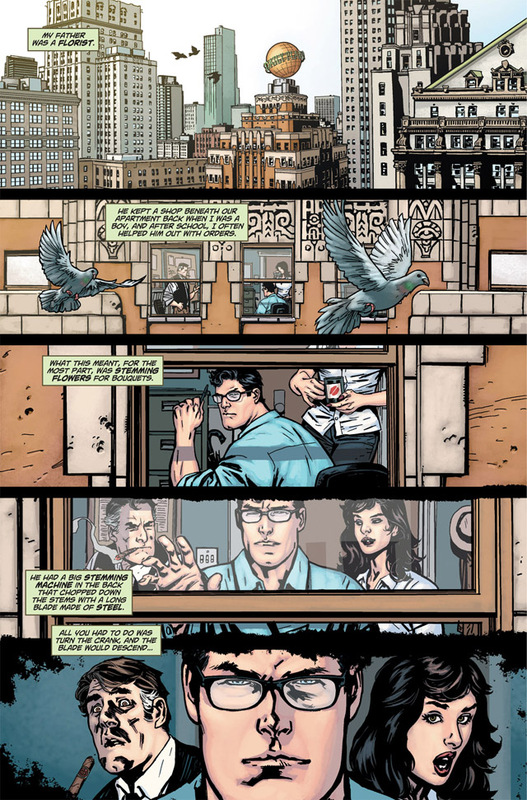 I especially like the emphasis on “Steel” when Clark Kent becomes discernable. I wonder, though, if this is also a further connection between Superman and some larger theme of super heroes acting as the steel blade that prunes the world of its problems or something, but that could be a whole other article. 3 – A great example of this is on page 12, where Alec gives a short speech worthy of Werner Herzog. He’s talking to Superman about working on his Bio-Restorative formula and takes a moment to point out the innate destructiveness of nature. 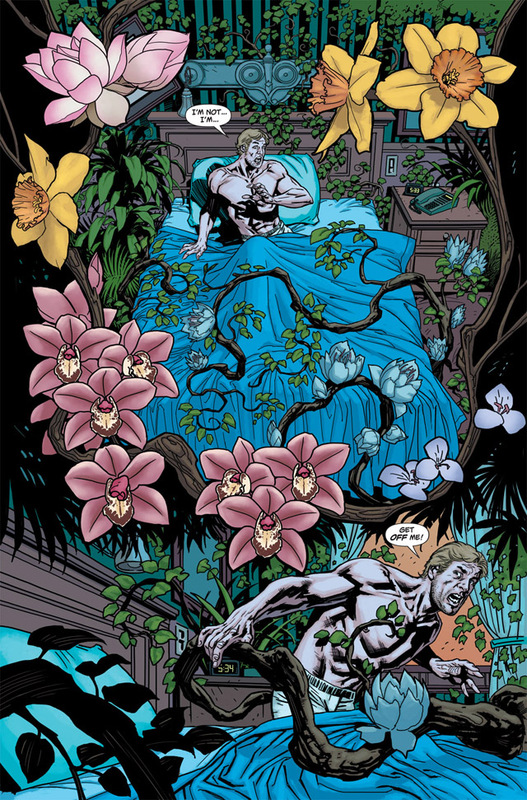 The closer Alec comes to remembering his connection to the Swamp Thing, the more intense the branch borders become. 5 – This is just another great bit of connection. The Other is preying on archaeologists who have excavated a mammoth skeleton, reflecting how Swamp Thing seems determined to dig up Alec Holland/The Swamp Thing’s past and examine it. 6 – Another cool thing to point out in this scene: the digital readout on the safe containing the Bio-Restorative formula reads 1971, which was the year Swamp Thing made his first appearance in House of Secrets. Also, the hotel Alec is staying at is “Totelben’s” – John Totelben was one of the artists on Swamp Thing during Alan Moore’s run.